Yvonne Turner reports from the 2016 Hever Castle Triathlon, the marquee event of the Castle Triathlon Series (www.castletriathlonseries.co.uk). Sibling bonding, friendship and sporting camaraderie were the theme this weekend at the Hever Castle Triathlon. The World’s largest children’s triathlon continued the Brownlee spirit, with a festival of sport at the historical Kentish and iconic venue. There were 108 pairs of siblings racing over the weekend including children, adults and elites, Sam and Tom Wade. The next generation of young triathletes also looked to continue the Olympic legacy as they competed alongside over 1,400 other children, including Bailey Matthews (Helen Rollason BBC Sports Personality of the Year 2015 winner), who this time rejected his walker for a solo run to complete his fifth and final Castle Triathlon Series event of the season. 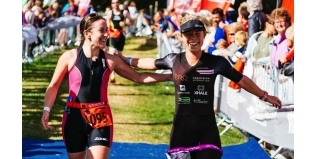 The spirit was exceptionally popular, one team, Team Phoenix, saw eight women complete their first ever triathlon as part of a rehabilitation exercise to recover from breast cancer. There were eight different course lengths, with children and elites using different versions of the same course throughout the weekend. Starter, super and sprint plus competitors kicked off the weekend on Saturday morning, whilst elites and long distance triathletes took the lead on Sunday morning, conquering the admirable distances of the Olympic and Gauntlet triathlon. The afternoons were left for the kids, allowing them to be inspired by the seniors in the morning, before taking on the course in front of friends, families and adult competitors in the afternoon. The Olympic distance saw a strong field of elites compete for the podium with Sam Wade taking the prize spot followed by Alastair Weymouth and Liam Lloyd. The girls had a great race too with Hannah Drewett finishing first ahead of Hannah Kitchen and Grace France. The unique swim loop around the River Eden and Sixteen-acre island was hailed as one of the best open water swim routes on the UK circuit. Winner of the Gauntlet, Ewan Brown (Edinburgh Road Club), commented, “The swim was incredible, the nicest swim I’ve ever done!” Female winner, Ruth Purbrook broke the course record set by Carol Bridge shaving four minutes off the lead position. Chantal Cummings took the second place followed by Linda Evans. Finally, national and local media once again descended on the Castle event to catch the action in the stunning grounds. However, the TV coverage for the event was second to the incredible well wishing for competitors received on BBC Breakfast. BBC sports reporter Mike Bushell broadcast a personally produced programme about the event and the incredible children’s participation. Which finished with a personal message of luck from the Brownleee brothers. The Castle Triathlon Series has announced the dates for 2017 with registration now open for early bird entries. Hever Castle Triathlon 2017 will take place on Saturday 23 and Sunday 24 September 2017 – sign up now.